The way audience engage is changing every day and very fast. When speaking about what has changed listeners engagement in recent years, we can’t help but think of live stream podcasts. They have entered the scene in the late 2000s and continue to impress huge audience of listeners by offering real time chats and new concepts of interaction. However, creating a professional-sounding podcast isn’t as simple as it might seem. Even for a single episode, a number of tasks need to be completed from recording to publishing and sometimes it’s inevitable to get caught in between. We’ve tried to summarize the most important aspects of starting your own live stream podcast as well as the monetization opportunities your live show can have. A good equipment and software is a guarantee of a quality production for a live stream podcast because quality podcasts take a lot of effort to get them going. If you’re interested in developing a solid listener base, you have to be prepared to release episodes on a regular basis. In order not to get lost in a myriad of choices try to keep things simple. Think about how your podcast will be recorded so you can easily find the right equipment. In general you should consider 3 things: cost, quality, and usability. Before spending any money on equipment you need to make sure you have a computer that can support your equipment and software. To record, edit or simply upload your podcast any Windows or Mac computer will do the job. You can do the recording directly on the computer or on a recording device, but for this your computer will need the right ports. USB microphones require open USB ports. Analog microphones, on the other hand, require audio-in jack, a USB port or sometimes Firewire port. Any microphone will work for recording your podcast, but listeners can usually tell the difference between low and high quality microphones. Condenser microphones are suitable for studio recordings and are more sensitive to sounds. This means they can pick up background noise. Make sure that you are away from unwanted noise if you choose to use condenser microphones. Dynamic microphones, on the other hand are great because they only pick up the sound in front of them. There is no need to worry about unwanted noise. Another good thing about them is that they are durable and provide better quality sound in contrast to condenser mics. 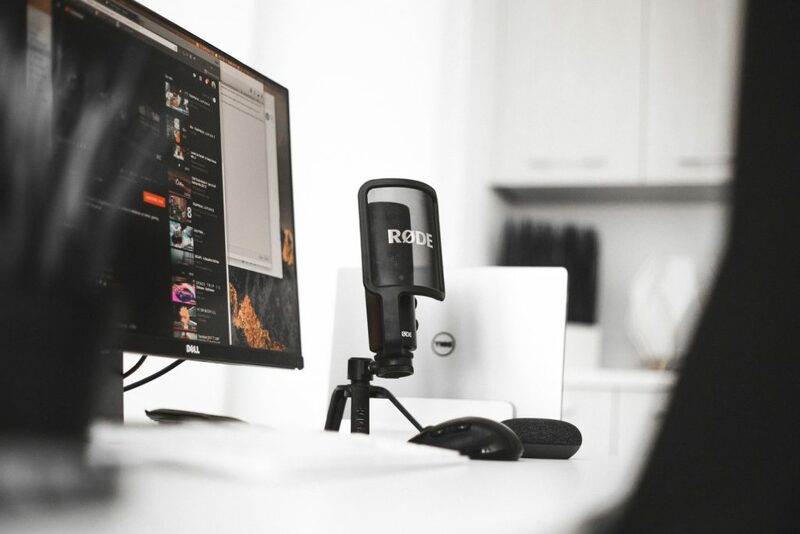 Investing in paid podcasting software if you’re just starting out shouldn’t always be the norm. Most people will recommend free open source programs like Audacity, Wavosaur, and LMMS. As for paid software there is also a lot of choice on the market: PreSonus Studio One, WavePad, or Adobe Audition. It all comes down to which one fits your podcasting need. Truth is just like blogs, there are tons of podcasts on just about everything. However, this shouldn’t be a reason for discouragement. The best thing to do is to find your passion about certain niche and start from there. Discover your spin of things and transform an old idea into something new and interesting that will create decent listener base. It’s a good start to ask yourself if there’s audience for what you want to talk about. For example, if your plan is to make a podcast where you’ll talk about healthy lifestyle in general, narrowing down your topic to fitness can make your coverage more specific. It all about finding an interesting angle to your main niche. According to Bridge Media Research, the ad market for podcasts was expected to generate $220 million dollars in 2017. If you’ve already got a successful live stream podcast, you’ve got every right to want to monetize it to compensate for your hard work. There are a few ways to get your podcast bring in some revenue. Sponsorships are the most basic form of monetization. Essentially, a company with a target audience that overlaps with your listeners will sponsor you to mention or promote their product or service in your podcast. In affiliate programs, advertisers use affiliate links to record the traffic that is sent to the advertiser’s website. This action is all part of an affiliate program where you link from your website to a third party website. If any sales are made through a particular affiliate link, that same link generates a comission for you. Amazon has probably the best known affiliate program which can be used to encourage your listeners to click and buy. Creating additional “premium” content that can only be accessed behind a paywall is another viable option that can be leveraged to monetize a live stream podcast. A premium content can be a bonus episode, image gallery, video etc. You can also offer your listeners a continuous membership that gives them access to your premium content which can also be accessed behind a paywall. Additional content, media, members-only newsletters can all be used to entice your listeners into buying a premium membership. When it comes down to using a paywall, InPlayer offers the easiest way to protect your digital assets. We have everything you need to start monetizing your podcast and transform your group of listeners into a community. The content you release, your podcast episodes to be specific, can contain powerful ideas. Have a working strategy no matter if you are creating content for your podcast or doing the marketing on different platforms. When released on a regular basis podcasts perform best and show better results. Developing a sold listener base means you have to be ready to release episodes consistently. All in all, be informed and guided about what you do, evaluate your performance and success will be inevitable.